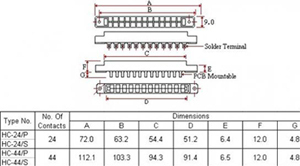 Contact Termination Solder / PCB Mountable . H. V. Break Down 1.5 KV . Material Contacts Gold, Silver or Tin Plated . Rated Current 5 Amp. At 300 Volts rms.